Join us for a spectacular drive through some of the best scenery in Banff and Yoho National Parks. We drive west along the Bow River alongside Castle Mountain, through the Lake Louise area and into Yoho National Park. We should see the distinctive yellow of the Alpine Larch trees high on the mountain slopes. The first stop is at the historic Spiral Tunnels on the Canadian Pacific Railway in Yoho National Park. The Spiral Tunnels were completed in 1909 to provide a replacement for the Big Hill, which was the most difficult section of the trans-national CPR route. The solution was an engineering marvel where two three-quarter circle tunnels were excavated into the mountains. We will stop at the Lower Tunnel Viewpoint where there is an excellent historical display. It is possible that we will see a train during our stop but there are no guarantees. Our next stop is Takakkaw Falls, fed by meltwater from the Waputik Icefield. The drive up to the falls from the highway is fun with several tight switchbacks on a narrow road. The falls are among the highest in Canada, with a total height of 384 meters (1,260 feet) from the base. We will stop and take the short walk to the base of the falls (500 meters / 0.3 mile) on a relatively flat trail. Lunch is at Emerald Lake Lodge, a classic mountain lodge built in 1902 on pristine Emerald Lake, one of the lowest elevation glacial lakes in the Rockies. We will have a short walk to the lodge from the parking area. There will be time before or after lunch for a walk along the lake or to rent a canoe for a paddle on the lake. The tour officially ends after lunch and will depart shortly thereafter. Participants are free to return with the tour leaders, or “peel off” during the return trip to visit sites in and around Banff. For those who wish to return with tour leaders, stop will include the Natural Bridge, a good example of the powerful erosive forces or water. Dress: Wear comfortable walking shoes for the short walk to the falls and walking at Emerald Lake. Hat and sunglasses are recommended. Weather is changeable in the mountains, so bring an extra layer or two. Maximum altitude is approximately 1,630 meters (5,340 feet). Tour Meister Note: Our drive travels west from Banff on the TransCanada Highway. The morning sun will be at our backs and we will have a fantastic view of beautiful mountain peaks as we drive along the Bow River Valley. 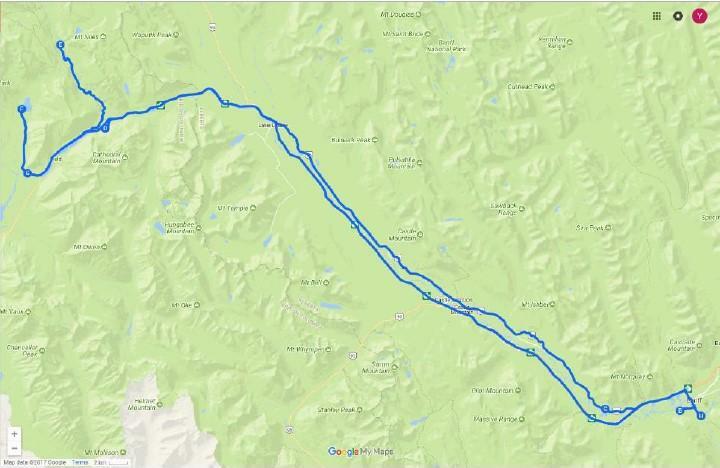 We will return travelling east on the TransCanada, although the option is open to take the Bow Valley Parkway, a slower route but with many interesting stops. Join us for a tour of both beautiful scenery and important Canadian history.